YTO motor grader uses blade to smooth the ground. Its blade is installed between the front wheel axle and rear wheel axle and it is able to lift, incline, rotate and protract to meet specific operating requirement. As a China-based motor grader manufacturer and supplier, we strictly apply ISO9001:2008 standard in the production of our grader to ensure its good performance. For more details about this construction equipment, please read the following descriptions carefully. Our versatile motor grader is applicable to the large-scale land leveling in the foundation construction of railway, expressway, airport, harbor, dam, industrial ground, and farmland, etc. Furthermore, it is also suitable for snow removing, virgin land scarifying, ripping, slope scraping, ditching, bulldozing and grading. 1.1 The diesel engine, hydraulic pumps, multiply control valve, dividing valve and differentials of our self-propelled articulated motor grader purchased from internationally well-known companies. 1.2 The specially designed engine hood and spacious driving cab enable the driver to enjoy a good visibility within 1m ×1m distance. 1.3 Torque converter and power-shift gearbox are electro-hydraulically controlled. The status of instruments and warning lights is displayed on the liquid-crystal screen digitally. 1.4 Steering system uses center articulated mechanism, tiltable front wheels and oscillating balance case, thus largely improving the maneuverability of the machine. 1.5 Braking system consists of single-circuit accumulator brake control, caliper disc brake and mechanical parking brake, ensuring the safe and reliable operation. 1.6 PY180C-2 motor grader can be also fitted with SHANGCHAI D6114 engine. 1.7 The hydraulic system pressure is 18Mpa. The circle rotation angle is 360°. The wheel track is 2150/2340mm. 2.1 PY185 and MG1217A motor graders are fitted with low-emission, high efficient Steyr diesel engine. PY185A and PY200TF graders are equipped with C6121 diesel engine. 2.2 PY185, PY185A and PY200TF road maintainer is fitted with ZF power-shift transmission gearbox. The gearbox is electro-hydraulically controlled. 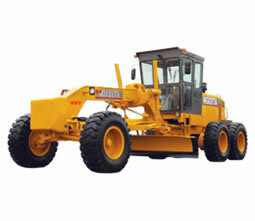 2.3 The construction machinery is designed with fully closed, ROPS/FOPS driving cab. 2.6 Both the front frame and rear frame adopt fully closed, box type structure. 2.7 The hydraulic brake system of PY185, PY185A and PY200TF motor grader uses German Rexroth components. 2.9 Front dozer-blade, rear ripper and scarifier are optional. 2.10 The maximum traction of our road grader is 105KN. The arch height is 610mm. The maximum tilting angle is 90 ° and the rotating angle is 360°. If you want to get more information about our motor grader, please contact us at anytime. In addition, our crawler tractor, road roller, binding machine, and combine harvester, etc., are all of high quality. We welcome you to order them.